Easter Sunday was a strange, though extraordinarily wonderful, day for me. Here’s why: I was so certain that Arwyn wanted to surprise me by holding an impromptu wedding on stage at Dolores Park (hosted by the Sisters of Perpetual Indulgence), that I made sure to show up within the first hour of festivities. I wasn’t particularly disappointed when my great expectations didn’t pan out; in fact, Arwyn was nowhere to be seen. However: his spirit is already such a joy in my life, that nothing could ever bring me down from that exquisite height of brotherly affection that is My Darling Dragon’s trademark gift to All Man&Woman-kind. Beloved Arwyn: No words could even come close to telling the world how joyously happy I’ve become, thanks to your wise friendship. Seeing as I’ve been romancing this noble Irish deity (Mannanan Mac Lir) for more than six glorious years, and I’ve finally (recently) come to realize he harbors enormous sweetness towards me, and always has since the first day we met in 2005: boy do I feel dumb, for not realizing such a bless-ed situation right out of the gate! But when you have suffered one of the most face-deforming kinds of acne (frequently reoccurring sebaceous cysts), on top of almost constant rejection, backstabbing, and threats from others in our dysfunctional gay family…then you can understand why my amazement at finding such a darling man like yourself, Arwyn, who holds nothing but the greatest affection for yours truly (at my advanced age of 61 no less). 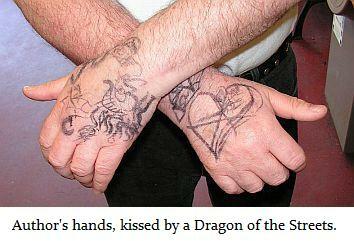 Took me quite a few years to wake up, eh, My Sweet Reptile? Guess I should apologize for being such a helpless slowpoke, but since I have personally gone through Hades and back again many times over, for your beloved soul and happiness (as you have for me, I do acknowledge)…don’t you think I’m worth the wait, as that is precisely how I feel about you, Most Beloved Dragon Of All Possible Dimensions? Your predicated response: shrug of the shoulders. To which you also respond (as predicted) with your usual, infuriating neutral shrug of the shoulders. To which you reply (once more: predictably and typically) with a noncommittal shrug of the shoulders. I am walking rapidly from my SRO, in hopes of scoring some ganja from Allen, who has just returned from Arcata, in hopes of making some good sales on hash and marijuana bud. He is located on 18th Street between Castro and Collingwood, with his humble presentation of semi-precious stones displayed in two, large clam-shell halves. But before I return to his current location, I find a colorful nosegay on the sidewalk several blocks before I arrive. So much for being made in His Own Image, eh? Now it might come as a horrid revelation to some (actually, replace “some” with “many”) that Jehovah’s original and timeless form is that of a dinosaur: a wing-ed dinosaur with scaly feathers. [ Yes, the Lord is my dwelling, and I assure you, my gay bros and sis’s: He absolutely LOVES us sexual minorities, You have no need to fear Him, Only to give your heart to He Who Adores You Infinitely, My Beloved Siblings! For there is no living thing ever created in God’s Great Universe, that would ever be condemned to eternity in Hell. That is the devil’s work, I assure you, My Sweet Children who rose up from the dust, to sing Life’s Praise. Nor does our Great Father require you to declare His Son’s name or worship Him as the One, True Creator. I worship My Lord with humor, and with compassion. None of this silly and frightful nonsense About anyone burning away in Everlasting Hel. All that Our Shepherd requires, is that you live by The Golden Rule each and every day. Neighbor unto neighbor: and a Good Samaritan to boot (pun intended)! Worship God, worship Goddess, worship Lucifer (but don’t be modest). Hell’s Bells! You can even worship the Spaghetti Monster, for all Jehovah cares. [ A tent? Even the Three Little Pigs lived better than that! Maybe the economy back then was as sucky as it is now, with rolling foreclosures and skyrocket debt. Be that as it may, I’d much prefer God’s protection from under a solid roof, than in some skanky pop-up tent! And that is the total sum of Psalm 91, a most encouraging and blissful passage of the Old Testament. I really don’t see anything wrong with this sacred passage, that can give so much hope to so many. 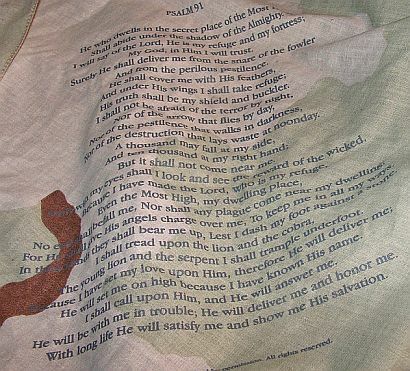 I consider myself BLESSED to have been presented such a beautiful psalm, in this Dollar-Store Bandana. Which bandana–left to me by a most darling vagabond with wooly golden hair and deliciously deep indigo eyes–gave me much succor over yet one more lonely night. I fell asleep with his bandana, which, in the latest witching light of candle and flame, revealed itself as a most sacred manifestation of finely woven gold for the base cloth…along with the most delicate (but strong) stitching of this psalm in the finest linen thread, dyed in blackest ink. Every letter was completely perceived in all its curves, by a single index finger. The raised letters were all in Hebrew; yet I could understand any Biblical phrases as if they were entirely in my native English tongue. The following morning, I woke up with this dollar-store bandana close to my heart, and too far from the dream. This entry was posted on Sunday, April 15th, 2012 at 2:40 pm and is filed under gay rights, homeless issues, risque, romance, san francisco, spiritual. You can follow any responses to this entry through the RSS 2.0 feed. You can skip to the end and leave a response. Pinging is currently not allowed.